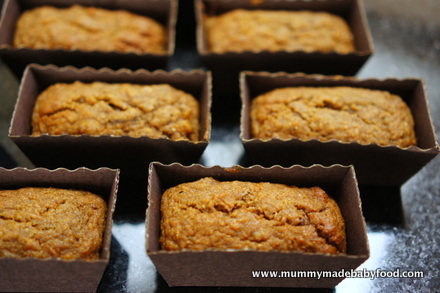 Here's a home made cake recipe for mini carrot loaves that's a great sugar-free alternative to conventional carrot cake, which has been a popular variation for sweet cakes since the medieval times. During those times, sweeteners were hard to come by and expensive, and as carrot contained more natural sugars than many other vegetables, it was a popular choice for cakes. As the grated carrot softens and cooks during the baking process, it lends a dense yet moist consistency to the final cake. 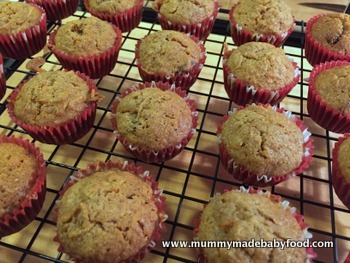 Fruit and vegetable cakes are a great way to add more fibre to your little one's diet, and those who object to fibre won't even notice when it comes in the form of cake! Not only is this healthy home made cake recipe sugar-free, using honey instead of refined sugar, but it is also dairy-free, using coconut oil instead of butter. Honey is sweeter than refined cane sugar, which means you need less of it in the recipe, and because it is liquid, it also provides added moisture to the cake. I have used half wholemeal spelt flour and half plain flour in the recipe below, but you could experiment with any combination of flours. I personally like the extra bit of density that spelt flour provides. Coconut oil does come in a flavourless format, which is meant to be used for baking, although you might find the subtle coconut flavour of regular coconut oil a nice added dimension to your cakes! This recipe yields approximately 8-10 mini loaves or 12 cupcakes. 320g carrots, washed, peeled and fine grated. Preheat oven to 180C / 160C Fan. Prepare your mini loaf cases, or line a 12-hole cupcake tin, if making cupcakes. Put the flour in a large mixing bowl, and whisk together with the baking soda, salt and ground spices. Fold in the chopped walnuts (if using) and sultanas. In a separate large bowl, beat the eggs lightly. Whisk in the honey, coconut oil and vanilla extract until combined and slightly thickened. Fold in the grated carrots. Pour the egg mixture into the flour mixture, and mix until thoroughly incorporated. 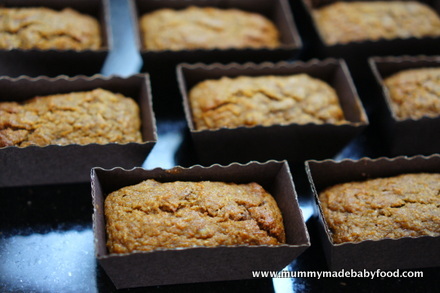 Evenly fill 8-10 mini loaf moulds, or a 12-hole cupcake tray, and bake for about 15-20 minutes. The cakes are done when a toothpick inserted into the centre comes out clean.